Shisha smoking came from the Middle East. A shisha is a water pipe, in which flavoured tobacco is inhaled through the hose. Shisha smoking has become popular in the West in the past few years. Shisha bars and lounges can be found in many cities. The water pipes are not safe to smoke because the water does not filter out all the toxins, and the nicotine is addictive. Several types of cancer and gum disease have been linked to shisha smoking. Shisha smoke may not only be a social activity; but the addiction to nicotine can increase the risk of shisha smoking. Spending too much time and money on shisha compared to occasional shisha smokers. Going out of your way to smoke shisha, especially at unordinary times, such as in the morning. Easily getting annoyed when people criticise you on your smoking shisha habits. Lying to people about your shisha smoking habits. Smoking shisha on your own. Finding it hard to quit from smoking shisha even though you’ve attempted several times.• Experiencing strong nicotine withdrawal symptoms which include craving for tobacco, anxiety, diarrhoea, irritability, restlessness, headache, drowsiness, stomach problems, constipation, difficulty in concentrating, etc. Thus, it eventually affects one’s performance. Shisha smoking has become your daily routine, i.e. you don’t get enough sleep because you smoke shisha late making you late for work or for school. The nicotine inhaled from smoking shisha influences your brain in such a way that nicotine addiction is harder to beat than most smokers realize. Nicotine is so powerful; it changes the structure and function of the brain. It acts like a stimulant and a relaxant as well. Influence of nicotine on the brain results in physical and mood-altering effects. Studies have shown that, one in two chain smokers die and half of these chain smokers never reached their middle age. Smoking also causes a number of cardiovascular diseases that includes heart attacks and strokes. Recent research has shown how nicotine acts on the brain to produce a number of behavioural effects and activates the brain circuitry that regulates feelings of pleasure, also called reward pathways. The brain chemical involved in mediating the desire to consume drugs is the neurotransmitter dopamine. The nicotine increases the levels of dopamine and enhances its abuse potential. Shisha smoking produces rapid distribution of nicotine to the brain. The nicotine is inhaled from tobacco smoke moves to the lungs, then into the bloodstream and up to the smoker’s brain within seven to ten seconds. Once there, nicotine triggers a number of chemical reactions that create temporary feelings of pleasure to the smoker, but these sensations are short-lived, subsiding within few minutes. As the nicotine level drops in the blood, smokers feel edgy and agitated as the start of nicotine withdrawal. In order to relieve the discomforts, smokers continue to smoke. According to a 2009 article in the Journal of Tobacco Induced Diseases, shisha smoke contains thirty six times more nicotine than tobacco cigarette. Nicotine produces pleasant feelings and is highly addictive. This addiction results in the repeated tobacco use that can cause many diseases. Withdrawal symptoms occur in the absence of nicotine and include irritability, impatience, anxiety, hostility, low mood, difficulty concentrating and restlessness. These withdrawal symptoms make quitting very difficult. 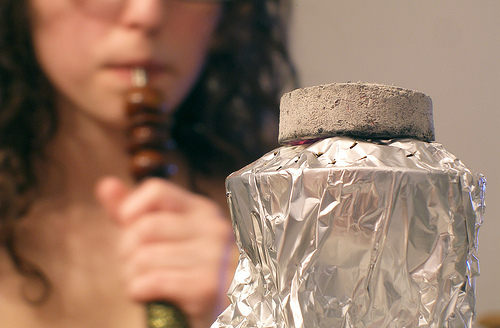 Shisha smokers also expose themselves to the dangers of carbon monoxide and nicotine. Due to the fact that shisha are typically smoked in long sessions, lasting forty five minutes or more, shisha users consume a very large amount of smoke each time they smoke. One session of hookah smoking releases approximately the same amount of carbon monoxide as an entire pack of cigarettes. High amounts of carbon monoxide have been linked to cardiovascular disease. Nicotine levels in shisha tobacco, on the other hand, are low in comparison to other types of tobacco. In this however, the amount smoked by a person per session means that the shisha smokers take in more nicotine in one session than other tobacco users.